The following is the basic 2 days (4 hours) Training Manual, I give training to companies, organizations. A map is a 3 dimensional graphic representation of a portion of the earth’s surface in a 2 dimensional space as seen from above, drawn to scale. When reading a topographic map, you need to visualize in your mind’s eye a 3-dimensional view of what the symbols and contour lines are representing. Historically, the development of highly accurate, detailed topographic maps has largely been driven by military requirements. A unique characteristic that distinguishes topographical maps from other kinds of maps is the fact that they show the topography or shape of the land in addition to other features such as roads, rivers, lakes, etc. Even in Nepal, there are cases of misleading of groups, so a map is always the best guiding tool if a guide is able to read it. We human being, have been making a map of a Mars, Moon, Galaxies and a Universe. A guide should know most details of trekking/ expedition routes as much as possible. Environmental factors like mist, fog in changed weather situation might confuse a guide for a correct direction, especially young or emerging guides. Tourists usually carry Maps with them while travelling and might ask you about off the beaten treks information. It is not always that you will find tourists that prefer normal trekking routes. Most important thing is that it makes you a professional one and stands out as a different from general guides. World is going digital, so carry a full battery on mobile, laptops, and download navigation and travel apps for your references. Correlate with Safety issues, Acute Mountain Sickness, Natural Disasters, Altitude. Longitude and latitude by GPS. Contact with GPS info for Rescue and Emergency. Calibrate it as per the guidelines of technology as directed while installing. It is not 100% accurate. Battery charges and its charging stations availability. Need Practice of its use and APPS differ upon company. How to search appropriate Apps and download Apps? Learn how to Navigate with Mobile Apps system. Demonstration of use of digital navigation tool on a real Map. Group Discussion on identification of geographical features on a map. Video presentation of a map in understanding contour lines and a real geography. Scale is represented in two different ways on a topographical map. The first is a Ratio scale. The ratio scale on this map is 1:24,000. What it means is that one inch on the map represents 24,00 inches on the ground. Below the ratio scale is a graphic scale representing distance in miles, feet and meters. The Graphic or Linear scale can be used to make fast estimates of distances on the map. 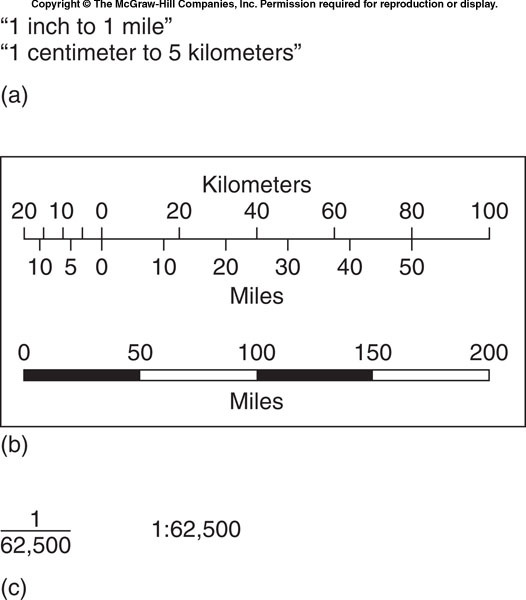 The space between the 0 and the 1 mile mark on the scale is the distance you must go on the map to travel one mile. A Topographic Map includes contour lines drawn to represent changes in elevation. Contour lines placed on the map represent lines of equal elevation above (or below) a reference datum. When you follow a path on a topographic map that crosses these contour lines, you will be either climbing or descending. A path running parallel to contour lines is relatively flat. 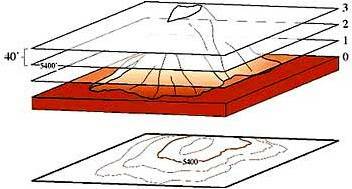 One of the advantages to using a topographical map is that it shows the three dimensional lay of the land. It does this by using contour lines. 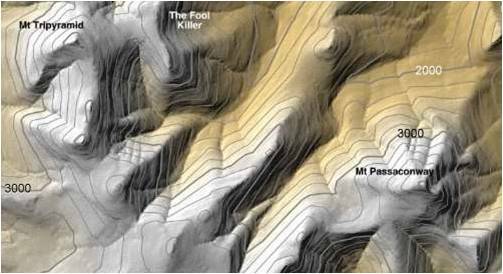 On the topo map they appear as the Brown Lines.The contour line traces the outline of the terrain at evenly spaced elevations. These are determined by the Contour Interval. The contour interval is found below the map scale. Tips for understanding contour lines. 1) Every point on a contour line represents the exact same elevation. Contour lines on the edge of a map do not appear to close on themselves because they run into the edge of the map, but if you got the adjacent map you would find that, eventually, the contour will close on itself. 2) Contour lines can never cross one another. Each line represents a separate elevation, and you can’t have two different elevations at the same point. 3) Moving from one contour line to another always indicates a change in elevation. To determine if it is a positive (uphill) or negative (downhill) change you must look at the index contours on either side. 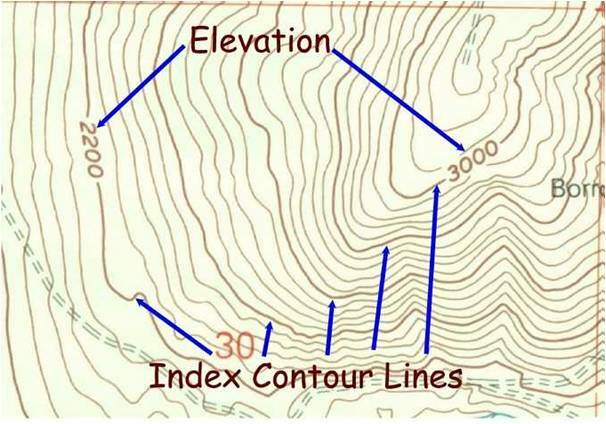 4) On a hill with a consistent slope, there are always four intermediate contours for every index contour. If there are more than four index contours it means that there has been a change of slope and one or more contour line has been duplicated. This is most common when going over the top of a hill or across a valley (see figure). 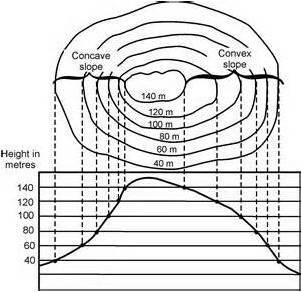 5) The closer contour lines are to one another, the steeper the slope is in the real world. If the contour lines are evenly spaced it is a constant slope, if they are not evenly spaced the slope changes.The most important thing to remember is that CLOSE contour lines mean STEEP terrain and OPEN contour lines mean FLAT terrain.Shaded relief added to a topographic map makes it more realistic and helps visualize the real landscape. 6) A series of closed contours (the contours make a circle) represents a hill. If the closed contours are hatched it indicates a closed depression (see figure). 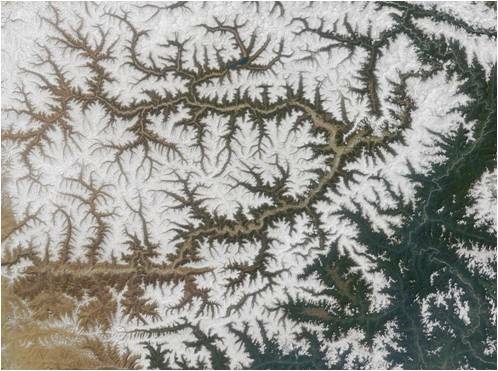 7) Contour lines crossing a stream valley will form a “V” shape pointing in the uphill (and upstream) direction. Every map has a legend, or key, that explains the meaning of the symbols used on the map. The legend is usually printed right on the map, although some maps, like USGS topographic maps, publish legends separately. Legends tell you what different lines mean, whether they are roads, trails, power lines, streams, or boundaries of some sort. Legends also show different symbols and translate them, like the symbol used for a spring, windmill, or maybe a gravel pit. The legend also provides information about the map including its title, scale, projection, cartographer, publisher, date of compilation, and date of printing. Orientation of a Map to the North direction is most important before making a decision. Once a map is oriented to the North direction(N↑)and a digital compass or a simple compass will help you to orient at exact direction for navigation. Many birds use Earth’s magnetic field to help them navigate when flying long distances. Scientists have not yet discovered the precise mechanisms involved, but it seems that birds can in some way detect changes in the angle of dip and in the magnetic declination, which together give an indication of latitude and longitude. A freely suspended piece of magnetic material-the needle of a magnetic compass, for example-points North-South, because Earth itself has a magnetic field. The earth’s magnetic poles are geographic poles. The angle between true (geographical) North and magnetic north is called the magnetic declination (or deviation). It varies at different points on the earth’s surface, according to the observer’s position relative to two poles and his distance from them. Not only do the magnetic north and south poles move slightly from year to year, but at certain periods in the earth’s past they have been completely reversed, so that the present magnetic north pole was at one time the magnetic south pole.Earth is not the only planet with a magnetic field. The magnetic poles of a magnet are the points where the attractive or repulsive force acting in an isolated north pole appears to be concentrated. The point of maximum repulsive force is the magnetic North Pole; the point of maximum attraction is the South Pole. How Contour Lines are constructed? John Wesley Powell, the great geographer and scientist, described a watershed as, that area of land, a bounded hydrologic system, within which all living things are inextricably linked by their common water course and where as humans settled, simple logic demanded that they become part of the community. Simply, a watershed is an area of land that all drains to the same receiving body of water, whether it be a stream, lake, or river. Another term for watershed is drainage basin. How do you find your watershed address? First, you figure out your location on a map in relationship to the nearest stream or river. Then you look to see where that stream or river drains to or connects. It might drain into another stream, river or even a lake. Continue to follow the flow of these bodies of water until you reach an ocean where your watershed address ends. How do you figure out the area encompassed by a particular watershed? A topographic map is needed for that. By picking out the highest elevations, divides between drainage areas can be located. If a raindrop falls on top of a mountain and flows downhill without evaporating or percolating into the soil, where will it end up? If it flows down the opposite side of the mountain, does it end up in the same water body? If not, it would be in a different water- shed. Within this major watershed there are many minor watersheds; each tributary or body of water is part of a small watershed. World is changing with technologies. Be adaptable to the new software for APPs. Be a professional guide in front of your client (Tourists) by displaying your unique skills. Map in Travel for Survival skills and knowledge of our surroundings. Weather change anytime so young, inexperienced guide needs to know it. Take a separate details course on Map Reading and Navigation. Basic Computer Skills for software experience. Map information are available in Point, Line and Polygon system. Bearing–Geographic orientation of a line given as an angle measurement in degrees clockwise from true north. Cartography – the art and science of producing maps, charts and other representations of spatial relationships. Contour – a line drawn on a map joining all the points on the Earth that are the same height above mean sea level. Coordinates – angular or linear values that designate the position of a point in a given datum or projection system. Coordinates, geographic – a system of spherical coordinates commonly known as latitude and longitude. Coordinates, grid – a plane-rectangular coordinate system expressed as eastings and northings. datum – a mathematical surface on which a mapping and coordinate system is based. Elevation – the height above mean sea level. Geocentric datum – a datum which has its origin at the Earth’s centre of mass. The advantage of the geocentric datum is its direct compatibility with satellite-based navigation systems. Geographical coordinates – a position given in terms of latitude and longitude. GPS – Global Positioning System – is a satellite based navigation system developed by the United States Department of Defense and widely used for civilian navigation and positioning. Graticule – a network of lines on a map or chart representing the parallels of latitude and meridians of longitude of the Earth. Grid – two sets of parallel lines intersecting at right angles to form squares. Grid convergence – the angular difference between Grid North and True North. Grid coordinates – the equally spaced vertical and horizontal intersecting lines superimposed over the face of a map. One set of grid lines runs north-south, while the other runs west-east. The position of a point on the map is described as its distance east from a north-south line and its distance north of an east-west line. Grid/magnetic (G-M) angle – the difference between grid north and magnetic north and is a positive value if magnetic north it is east of grid north and a negative value if it is west of true north. latitude – the latitude of a feature is its angular distance on a meridian, measured northwards or southwards from the Equator. longitude – an angular distance measured east or west along the equator from a reference meridian (Greenwich). Magnetic north – the direction as indicated by a compass to the earth magnetic pole. Map – a representation of the Earth’s surface. A cadastral map is one showing the land subdivided into units of ownership; a topographic map is one showing the physical and superficial features as they appear on the ground; a thematic map displays a particular theme, such as vegetation or population density. Map projection – any systematic way of representing the meridians and parallels of the Earth upon a plane surface. Mercator projection – the conformal cylindrical projection tangential to the Equator, possessing the additional valuable property that all rhumb lines are represented by straight lines. Used extensively for hydrographic and aeronautical charts. Meridian – an imaginary line from the North Pole to the South Pole connecting points of equal longitude. Relief – the deviation of an area of the Earth’s surface from a plane. It refers to the physical shape of the surface of the Earth. Topography – description or representation on a map of the physical and cultural surface features. Transverse Mercator (TM) projection – a conformal cylindrical map projection, originally devised by Gauss, also known as the Gauss-Kruger projection. As its name implies, its construction is on the same principle as the Mercator projection, the only difference being that the great circle of tangency is now any nominated meridian. Meridians and parallels are curved lines, except for the central meridian for a specified zone (meridian of tangency), which remains a straight line. The amount of scale distortion may become unacceptable at distances greater than about 1.5 degrees in longitude from the central meridian.